Cranbrook was founded in 1904 by George and Ellen Booth in Bloomfield Hills, Michigan. Cranbrook is comprised of a graduate Academy of Art, an Art Museum, House & Gardens, Institute of Science, and Pre-K through 12, college preparatory school. There is no formal class structure but an active program of studio work, critiques, reading groups/seminars, and student group projects. They offer study in the following areas: Architecture, Ceramics, Fiber, 2-D Design, 3-D Design, Metalsmithing, Painting, Photography, Print Media, and Sculpture. Garry Knox Bennett (b. 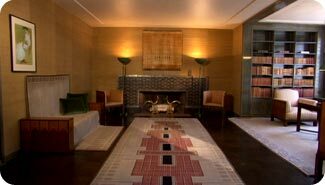 1934, Alameda, California) is a furniture maker who works in Oakland, CA. He attended the California College of Arts and Crafts where he learned to paint and sculpt. In the 1960s, he used the skills he learned to found a metal plating business, specializing in handmade jewelry. 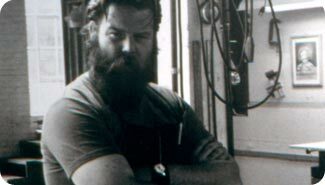 In the 1970’s he began making clocks which expanded into furniture design. 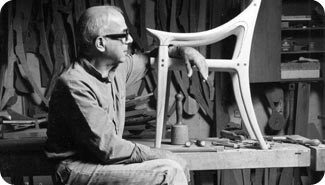 He is most well known for his chairs and for combining conventional woods and unusual materials such as plywood, aluminum, steel, and plastics. Pat Courtney Gold (b. 1939, Warm Springs, Washington) is a basket maker influenced by her ancestors, the Wasco Indians. Her baskets are based on the baskets of her Wasco ancestors using the full turn twine technique but she experiments with different materials and designs, with similar patterns and motifs. The materials she uses include cattail leaves, tule, dogbane fiber, cedar bark, tree roots as well as chenille, dyed wool, and other textured materials. She is enrolled in the Wasco Nation of the Confederated Tribes of Warm Springs, Oregon. She received her BA in mathematics from Whitman College, Washington and has taught mathematics and worked as a mathematician-computer specialist. Mary Jackson (b. 1945, Mount Pleasant, South Carolina) is a basket maker who lives in Charleston, South Carolina with her husband Stoney. She makes sweetgrass baskets that come out of a tradition that has been passed down to her from her ancestors. It originated in West Africa, and then was brought to America by slaves. 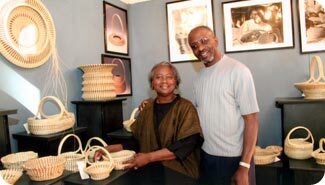 This kind of basket making is an identifying cultural practice for people who were cut off from their own history, and has been a part of Charleston and Mt. Pleasant communities for more than 300 years. 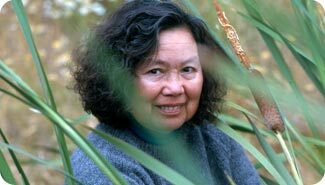 Jackson uses sweetgrass, palmetto, pine needles and bulrush in her work, which is innovative, but always mindful of its past. Tom Joyce (b. 1956, Tulsa, Oklahoma) is a blacksmith who works in Santa Fe, New Mexico. At the age of 13, he became an apprentice to a blacksmith and at 16 he dropped out of school to dedicate his life to metalsmithing. 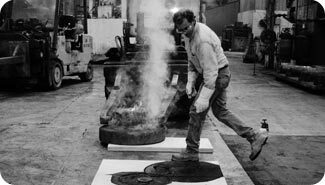 He constructs in iron to express the landscape through classical and contemporary forging techniques. He creates architectural blacksmithing pieces like gates as well as lighting fixtures. He is a recipient of the MacArthur Foundation fellowship and was an artist in residence at Kohler Arts/ Industry Program’s factory in Wisconsin. Sam Maloof (b. 1916, Chino, California) is a self-taught furniture maker, woodworker who works and lives in Alta Loma, California with his wife Beverly. He married his first wife Alfreda Ward (d. 1998) in 1948 and together they founded the Sam and Alfreda Maloof Foundation for Arts and Crafts in 1994. He is known for his signature rocker—which is comfortable above all, and has been commissioned by Presidents Carter, Reagan and Clinton. In 1985 he was awarded the MacArthur Foundation fellowship “genius grant,” making him the first craftsman to ever receive the honor.